When it comes to invincibility items, Super Mario Bros.' Super Star gets all the glory. I can't really blame people for loving that little five-pointed, beady-eyed power-up: it triggers that catchy tune whenever you snag one to briefly become unstoppable, and the way it bounces around can be a source of giddy excitement (or frustration, when chasing one turns fatal). But there's another platforming pick-me-up that deserves more popularity than the so-called Starman, for he is richer in character and more flexible in function. His name is Aku Aku, and it's time we all paid him some respect. Aku Aku is a staple of the Crash Bandicoot series, having accompanied the orange marsupial on dozens of perilous journeys through space and time to defeat the villainous Neo Cortex. In what will surely become a tidbit for 'Feel old yet?' 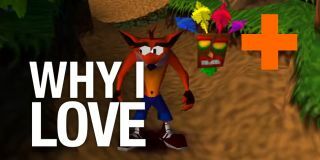 listicles, September 9th, 2016 marked Crash Bandicoot's 20th birthday - two decades since Naughty Dog debuted what was to become the PlayStation's premier 3D platformer. And with remastered versions of Crash's first three games headed to PS4 next year, a new generation of players can appreciate the series' tight controls, brilliant level design, and the sentient voodoo mask that aids you every step of the way. Being that this is also Aku Aku's 20th anniversary, allow me to explain his greatness by way of his original, mostly mute incarnation (despite loving his expansion into a speaking spiritual guide in the sequels, complete with a vaguely Morgan Freeman-esque timbre). In Super Mario terms, Aku Aku is effectively the Super Mushroom and Super Star combined into a single item. Super Mushrooms are unique in that they alter Mario's size, but their primary purpose is to give players an extra point of durability; an appreciable buffer between touching an obstacle and instant death. Freeing Aku Aku from one of the many crates scattered around the Wumpa Islands provides the same benefit, only better. Grabbing a Super Mushroom as the embiggened Super Mario does nothing (besides earning you a paltry sum of points), but finding one of Aku Aku's magical clones when he's already floating at your side doubles his potency, giving you two extra hits instead of one (and making the rainbowed feathers atop Aku Aku's head turn a majestic yellow and red, accentuated by a golden glimmering). The real payoff comes when you've nabbed a third Aku Aku. Like a kid-friendly version of Splatterhouse's Terror Mask, Aku Aku temporarily grafts himself to Crash's face to imbue the player with godlike power, triggering a generous 20 seconds of invincibility denoted by tribal drumming. Only, it's not just invincibility: along with vaporizing any enemy you touch, coming into contact with the delightfully breakable crates that fill each level instantly shatters them, without any threat of accidentally spinning away the bounty of fruit (Crash's version of coins) within. The Super Star doesn't provide such an invigorating freedom of movement; the closest power-up parallel in Mario's universe would be the Mega Mushroom introduced in New Super Mario Bros., which lets you break through blocks at the cost of extremely sluggish movement. As with the Super Star, the omnipotence of Aku Aku's final form still has its limits, in that he can't save you from a tumble down a bottomless pit. But c'mon - you can't expect him to do everything for you. Yoshi can provide the same degree of companionship as Aku Aku. Thank goodness that Aku Aku decided to shed this mortal coil and infuse his spirit into a wooden mask, so that he could embolden and protect future generations (of shorts-wearing cartoon protagonists or players, whatever the case may be). As video game Witch Doctors go, I'd rank Aku Aku's charms right up there with Banjo Kazooie's Mumbo Jumbo (and far ahead of Clayfighter 63⅓'s Houngan). And as a power-up, Aku Aku shines so much brighter in my eyes than a Super Star ever could.